The Westin in Cabo San Lucas is a resort just outside of Cabo San Lucas with stunning Sea Of Cortez views and nearby golf courses. The views are incredible from your room. If you happen to go from January to March you will see a lot of whale activity as this is the whale watching season. It's an incredible site watching them swimming around, not far from the beach. The Westin has seven pools for you to splash around in. One has a bar if you like to drink when you are lounging by the pool. You have an infinity pool. If you're with your family there's a children's pool for them to use. There's even a volleyball pool as well for the water sports fans. If you like resorts with pools then you are in pool heaven at the Westin in Cabo San Lucas. With seven to choose from as well you don't need to get out so early to get your very comfortable, padded lounger. Some resorts you have to be out by 7.30, but it's much later here some days. Some days you can get a bit restless laying by the pool. When this happens the Westin has plenty of activities for you to try. If you enjoy your activities then you might spend more time on them than being at the pool. La Playa - A variety of Seafood and Mexican dishes. You can enjoy the food here from mid-morning till late afternoon. La Cantina - A sports bar that is open in the evening. Arrecifes - This is a dinner only restaurant situated on a hill with a view of the Sea Of Cortez. Asian Corner - Open in the evening this little Asian restaurant in situated in Arrecifes restaurant. Enjoy Asian cuisine, and a sushi bar here. It opens in the evenings. La Palapa Bar - This bar is open mid-morning to late afternoon. You get a bar menu here. Margaritas Bar - This is a poolside bar for your sun bathing food and drink. If you plan to go out of the resort visiting places a rental car is a good idea. It will save all the cab fares that can mount up very quickly. 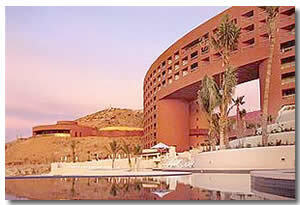 The Westin in Cabo San Lucas is a nice resort with plenty of amenities. Even if you don't want to go into Cabo San Lucas or San José del Cabo you have everything you need in the Westin resort.